Let’s face it, you’ve wondered. Will you EVER realize those dreams? You have probably come to the conclusion good things happen to those lucky few. While dreams and a future full of possibilities will never happen for you. Maybe you can be one of those lucky ones. Besides, you have at least thought about what you truly want out of life. THE REALITY: There is no way to know. We are all different and have different ways of doing things, learning and creating. Our circumstances are all different there are no set rules, but there are warning signs. 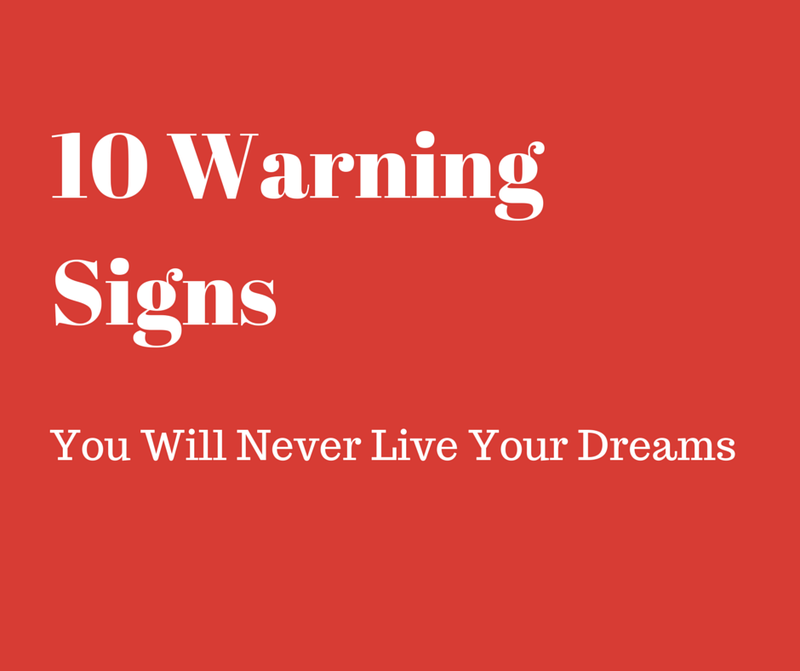 If you are not realizing your dreams or not even remotely on track, there may be some signs telling you something is wrong. Are you constantly telling yourself you are just too busy to do the things that will make an impact in your life? "There’s too much housework I have to do"
"I’ll wait till I have more money"
"I’ll wait till I have more time"
"when the Kids grow up"
"It won’t work for me", and so on? If you want to live your dreams today you must make the time to do what is necessary, day time TV is NOT part of the plan. When you live for today and do not have any goals or plans for the future, this is a bad idea. You are ultimately allowing other people to influence your future decisions, by not having a mind of your own. Living for today puts your life on ‘auto-pilot’. This is something you don’t want to do, especially if you want to live your dreams. Not making decisions about ‘tomorrow’ is like giving up on life and throwing it away. From a very young age it’s the same story, go to school, then college/university, get a good job, climb the corporate ladder, save your money then retire. What if I told you this ‘plan’ is flawed, I believe it is, and realized a few years ago. The harder I worked (in my 3 jobs) I was still broke and unhappy, I felt like something was missing. It was. Instead of following the 'norm', you should find what I call your Happy Triggers (your values, strengths and passions) and figure out how you can make your life be as fulfilling and meaningful as possible. According to Dr. Gail Matthews, psychology professor at the Dominican University in California, did a research study and found that you are 42% more likely to realize your goals just by writing them down. Write your goals down and commit to following a plan. You can plan, visualize and set goals all you want but without action, your dreams will stay dreams. Taking action on your desired lifestyle and making those dreams a reality might not be easy but will be worth it. Don’t let your dreams stay dreams, make them come alive. This is such an easy thing to do when circumstances don’t go your way, “I know let me blame the nearest person I can find”. Making your problems someone else’s mistake will keep you from getting anywhere in life, never mind living your dreams! Playing the blame game is easy. Take responsibility for your own life because you’re the one who makes the choices. Fear will always hold you back, but until you find ways of overcoming fear of failing, rejection, being ridiculed, not conforming to the masses, being lonely, working alone or anything else, that doesn’t allow you to live fully, you will rob yourself of the dreams you hold dear to you. The best way to overcome fear is to do the very thing you fear. Scared to start a business…? start it anyway. That passion and drive you have daily will come from you purpose in life. A mission, a life project or whatever else you may want to call it. What would make you jump out of bed in the morning ready and passionate about your day? Like fear self doubt can greatly sabotage your mission. Self doubt is a liar and will try to make you feel small. You are great and have great ability to do more than you think. Create empowering statements about yourself and repeat them until you start to believe they are true, because they are. Your dreams don’t really matter. They never did and that’s ok because you have no burning desire to live your dreams. If you did, you would make every moment of your life a reflection of that desire, taking small steps to reach your goals and plans. Time is all you have, what you do with it matters. Beach lover, Mom & Entrepreneur. Server responsed at: 04/25/2019 8:23 a.m.